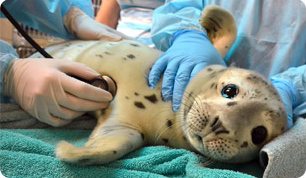 The Rescue and Response team at The Marine Mammal Center is seeking applicants for their Monterey Bay Operations Rescue and Response Internship working primarily with stranded pinnipeds, as well as occasional cetaceans and sea otters.The Rescue and Response Internship is an exciting opportunity for individuals who are interested in increasing their experience and knowledge of marine mammals and the Marine Mammal Stranding Network. This is an unpaid internship. Applicants are responsible for their own housing and transportation for the duration of the internship. Unfortunately, we are unable to host international applicants at this time.